The British defence industry started to peel back the veil of secrecy from one of its most intriguing projects today - but what was said was overshadowed by what wasn't. Taranis is a remotely piloted air system designed to prove that British industry is capable of developing a high-tech combat aircraft that could be flown by remote control while exhibiting the sort of reduced visibility to radar that has hitherto been the preserve of expensive and advanced American (and, latterly, Chinese) airframes. The fact that the aircraft has flown successfully, and not only met but exceeded its creators' expectations in a series of tests conducted late last year, is a great news story for the British defence industry. That the programme should remain shrouded in an excessive blanket of classification means that it's a story that is frustratingly difficult to tell. At the media briefing held in London this morning, BAE Systems' Nigel Whitehead repeatedly stressed that Taranis is "the most advanced aircraft ever built in Britain". He's probably right, but without any data offered to support the claim, it's just an empty phrase. Whitehead clearly has that supporting evidence: but the peculiar decision by the British government to keep much of the Taranis programme classified means it's impossible for him to share any of it with the media, or indeed with British taxpayers, who have funded the parts of the Taranis budget that have come from the public purse. Defence equipment minister Philip Dunne insisted that there were good reasons for keeping much of the backstory to the Taranis development under wraps. "The reason it's been highly classified is because it includes some technological advantage that this country wants to keep control of," he told me, "and not reveal to people who may wish to find weaknesses or potential flaws in the system which could undermine its effectiveness." And it is indeed likely that there are elements of this development programme that are genuinely unique, which haven't as yet been stolen by persistent cyber attackers and incorporated into Chinese designs, and which rival manufacturers elsewhere around the globe would give their eye teeth to know all about. 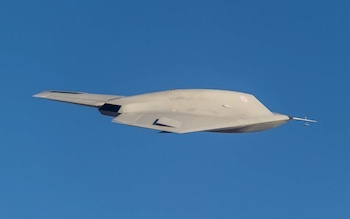 But what's most obviously striking about Taranis is its outward resemblance to a number of other similar aircraft - Boeing's Phantom Ray, Northrop Grumman's X-47B, and Neuron, the product of a pan-European collaboration led by Dassault. There are solid reasons why these aircraft look similar: they are each the result of a different group of highly skilled aviation professionals looking at very similar lists of requirements, and building the aircraft they think will most likely succeed in ticking those boxes. Each project set out to build an unmanned aircraft that would be able to make a decent fist of evading radar detection, could get in and out of a combat zone relatively quickly, and had some room on board to carry precision-guided weapons. If that's what you are trying to do, there are certain characteristics that your aircraft is likely to adopt. Its shape, governed by the requirement to scatter radar signals while retaining sufficient internal space to carry missiles, will broadly be similar to a scaled-down Northrop B-2 Stealth Bomber, with no vertical tail fins and a jagged trailing edge; it will need a jet engine as opposed to the propellers that the current generation of combat UAVs use, for stealth again but also to give it the required speed; attention will have to be paid to how the jet engine exhaust exits the aircraft, as contrails and heat can be as much of a giveaway as a big radar return; and, while nippy, it's not going to be supersonic, because that, too, makes the aircraft easy to detect. No wonder, then, that those four aircraft all look more or less the same. Indeed, to the admittedly untrained and inexpert eye, the only thing that really seems to separate Taranis from its cousins is that very little information about it has been published. The test flights that were confirmed today took place last year - first flights for the other three were announced within hours of taking place and footage posted to YouTube. The aerial imagery released today is the first time photographs have been published showing Taranis from any angle other than head-on: the other three aircraft have been photographed from multiple angles for several years. No imagery of the interior of Taranis or any of its components has as yet been made public: in 2010 - curiously, on the day after Taranis had taken its public bow, wreathed in dry ice and under a fusillade of strobes, like the announcement of which Hollywood superstar was about to play the next Bond villain - a programme manager from Dassault showed a London conference images of Neuron under construction, including one of the exhaust duct, which in past stealth programmes had often been considered to be one of the more taxing design challenges. All of this might not matter so much were it not for the decidedly mixed messages it gives out. 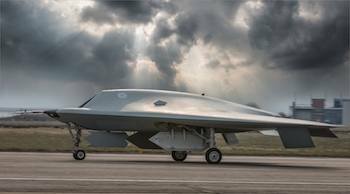 Three weeks ago, many of the same aerospace and defence journalists who attended today's Taranis briefing were at RAF Waddington, being shown around the Reaper ground control stations from which combat missions over Afghanistan are now being flown. (A piece by me on this will appear in next month's edition of Aerospace, the monthly magazine from the Royal Aeronautical Society.) A big part of the reason for inviting the media to Waddington was the growing concern within the RAF and the MoD that public perception of unmanned aviation is running a long way off the practical reality: without opening up a bit and trying to show that these are just military aircraft like all the others, only with the pilot on the ground rather than sat behind the nose cone, the notion is allowed to grow that there's something ugly and sinister going on. Whether or not the RAF and the MoD are ready to accept that the battle over terminology has long been lost - to the general public, these are always going to be "drones" - the need to engage in some plain talking on this subject is clear. What's at stake now is what people think of when they hear the term, not what term they will use. 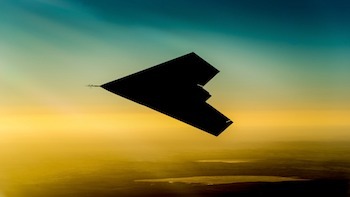 And yet here's Taranis, now in a more befitting military light grey rather than the Darth Vader black it sported during that 2010 launch event, still cloaked in secrecy, still wreathed in governmental obfuscation. Things we were told today included the date and time of the first test flight (10th August, 2013), the identity of the test pilot (BAE's Bob Fraser), and the cost of the programme to date (£185million). Yet the details that are being kept under wraps are utterly baffling. What possible reason is there for refusing to confirm where the test flights took place? Every indication, from public records of the C-17 flight that delivered the Taranis aircraft from BAE's facility at Warton, to previous acknowledgements of where the company flew its Mantis unmanned aircraft demonstrator, to a basic visual comparison of the footage of Taranis with other footage known to be taken there, suggests it was at the Woomera test range in southern Australia - so unless the flights took place without the permission or knowledge of the Australian government, there appears to be nothing gained by refusal to confirm this essentially trivial detail. Why, when we know from looking at other visibly similar aircraft, that the cruising speed is around Mach 0.8 or just above, is the speed of the aircraft classified? If one of the 250 British companies involved in manufacturing the aircraft and its associated control and other systems has succeeded in finding a new way to build inherently stealthy components or has found new and revolutionary means of lowering the radar cross-section of flying vehicles, that's definitely a secret worth hanging on to - but saying how many times the aircraft has flown is not likely to result in revealing it. And in any case: the F-35 - a production aircraft that at least nine nations around the world, including the UK, will actually be using in any possible future conflict - also features advanced stealth capabilities, yet its prime contractor, Lockheed Martin, often takes journalists on tours of its Texas production line, and shows us first-hand how staff work to reduce the radar cross-section at the manufacturing level, rather than relying (as early stealth designs partially did) on taking a stealthy shape then coating it with radar-absorbent materials. This really should be one of the great British industrial success stories. A totally British design, built by British companies, on what is, be the standards of these things, a pretty lean budget - delivered a bit late, but, we are told, with a great deal more achieved than was originally planned. It not only proves that the British aerospace industry is capable of achieving these complicated and demanding goals, but that it can do so relatively cheaply. This is no small matter, especially when one considers that the current fleet of unmanned air systems fielded by the British military includes seven aircraft types, none of which are British designs; and no British military unmanned aircraft is currently in production or use by an overseas customer. The successful conclusion of phase one of the Taranis development should be being shouted from the rooftops across Whitehall, yet all we can point to are vague claims that cannot be publicly substantiated, and a couple of minutes of video showing an aircraft flying in a location we're not even allowed to identify. All at exactly the same time when the MoD wants the media and the public to think it's got nothing to hide when it comes to its future plans for unmanned air systems. Click here to add your comment. Comments will be subject to approval and should not be defamatory, obscene, racist, in breach of copyright, or contrary to law. Neither Angus Batey nor the site host is reponsible for any views expressed here.